LiquidPoker - Free VIP status at Skrill from LiquidPoker - for both new and existing accounts! Free VIP status at Skrill from LiquidPoker - for both new and existing accounts! We come with another new promotion for our readers! 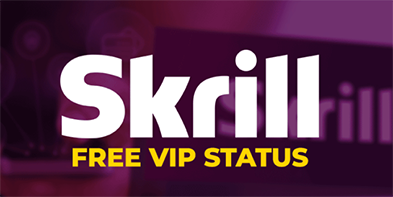 Now you can get a VIP status at Skrill or Neteller for three months completely FOR FREE (free VIP is always given until the end of current calendar quarter). Submitting it at the start of April means you get full use of promotion. 100% safety of your funds if you use 2 factor authentication. Free VIP Skrill from LiquidPoker– how to get it? For new accounts: just create your account through our link, verify it with documents and send us your email and numerical user id to sebastian@liquidpoker.net or through our contact form (click here) and you are done! - there were no deposits made to any merchants in last 30 working days (player transfers, card purchases and cash outs don't matter). ID number that can be found in the right upper corner upon logging in to the wallet (click the head icon located next to your surname after login). It's that simple. For high depositing accounts (30,000$+ in a month) we also have a special cashback on your deposits. Contact us sebastian@liquidpoker.net or through our contact form (click here). Existing accounts as well! If you want to create an account at Skrill and enjoy benefits of free VIP and cashback for higher depositing accounts, with more promotions coming the future regsiter at Skrill with LiquidPoker right now!